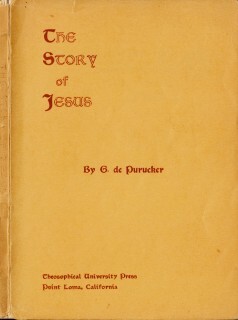 GOTTFRIED DE PURUCKER was born in 1874 at Suffern, New York, son of a prominent Anglican minister who for some years served as chaplain of the American Church in Geneva, Switzerland. He studied and mastered 13 languages, and specialized in Greek, Latin and later on in Sanskrit. In 1903 he moved to California and settled in the International Headquarters of The Theosophical Society (Point Loma). 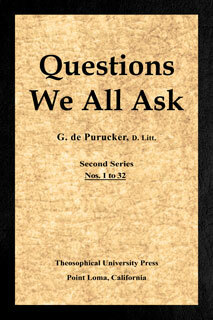 Dr. de Purucker was head of The Theosophical Society from 1929 until his passing in 1942. Perhaps his greatest contribution to spiritual thought has been his elucidation of the writings of Helena P. Blavatsky. 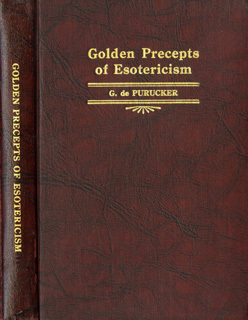 G. de Purucker distinguishes himself by the clarity with which he explains theosophical teachings and the accuracy with which he preserves their purity. We find in him the rare combination of a scholar with a comprehensive knowledge and a deep sense of compassion with humanity. His works on Esoteric Philosophy are imbued with the universal message of the unity of all living beings, which, to this day, makes a strong appeal to everyone who has humanity's fate at heart. 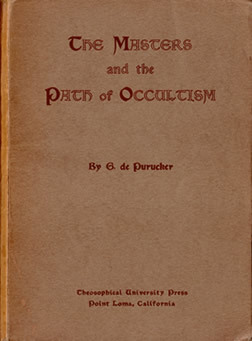 His books can be rightfully considered as theosophical standard works, since in a well-founded way he disproves the misconceptions and fantasies that, unfortunately, are always accompanying any attempt to free humanity from the veils of illusion. Anyone who to this day, more than seventy years after his passing, searches in his voluminous oeuvre in order to find answers to actual questions of life, will rarely be disappointed. The Esoteric Tradition stretches back into the beginnings of time. It is that line of teaching and teachers, that golden thread of Truth, which has never been broken and which reaches mankind today through the Mystery-Schools of the present, as it did the men of ancient times through the Mystery-Schools of the past. Helena P. Blavatsky herself pointed to the twentieth century as the time when at least the fundamental thoughts contained in The Secret Doctrine would be seen as comprising the principles of an Ancient Wisdom which far antedates the Vedas. 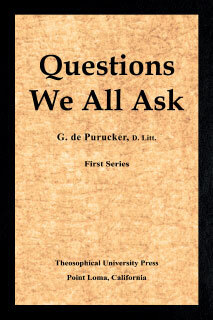 This is the wonderful theme which G. de Purucker in these volumes explains and illustrates by lucid description of the doctrines of the archaic Wisdom-philosophy. 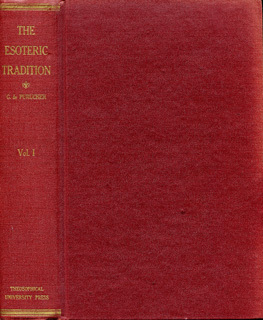 The grand scope of this work, covering the occult teachings concerning the birth and death of worlds and man's relation to those worlds, and the method by which man can gain definite spiritual illumination, is revealed by the following selection of chapter headings: Worlds Visible and Invisible - How Man is Born and Reborn - The Evolutionary Pathway to the Gods - Esoteric Teachings on the Evolution of Human and Animal Beings - Death and Afterwards: A Study of Consciousness - The Astral Light and the Life-Atoms - The Circulations of the Cosmos - Great Sages and Their Place in the Cosmic Hierarchy - Pneumatology and Psychology: A Study of Man's Inner Nature - The Esoteric Schools. This little book contains certain teachings given for study and for meditation to Chelas in the Esoteric School. H.P.B. 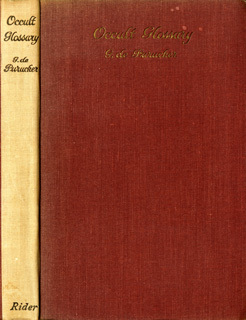 's 'The Voice of the Silence' comprises a number of extracts from the same sources of teaching in a reproduction which is faithful almost verbatim to the original works from which she drew; but the phraseology in that wonderful little work of hers is often highly technical and therefore difficult of understanding by Occidentals trained almost from birth in a quite different psychology. I hope that readers of the following pages will be illumined with the same Light and receive the same inspiration from the following extracts, translated or paraphrased from the books of the Esoteric School, that I myself in past years have received. (...) For all students of the Ancient Wisdom, for all who yearn to know something of the life that Chelas -disciples- of the Ancient Wisdom lead, I know that this collection of extracts from the archaic teachings of the Wisdom-Religion of mankind, as taught in the Holy Order of Compassion, will be helpful and stimulating. This book is for those to whom the theory of the ape-ancestry of man is distasteful yet who ask for something more than theology to explain man's origin and destiny. It is thoroughly scientific without being materialistic, and deeply religious yet not dogmatic. 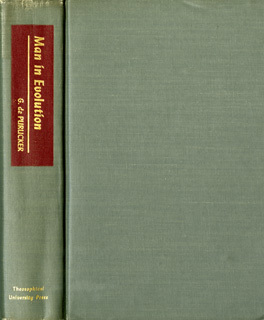 The physical evolution of man as the most primitive of all the mammalian stocks is convincingly set forth, corroborated by statements from eminent scientists of today. Growth of body, however, is but the natural effect of an inner psychological and spiritual urge; and the author shows that it is along the lines of this inner drive that are to be found the signs of man's true immortality. Man's origin is not lowly, nor is his future a 'dead-end.' Not only has he survival value, but his destiny, sketched herein with an authoritative and inspired touch, is so grandiose, so splendid, that the intuitive reader cannot help but catch a glimpse of that 'vision' which is the only ground for hope in the continuance of the human race. 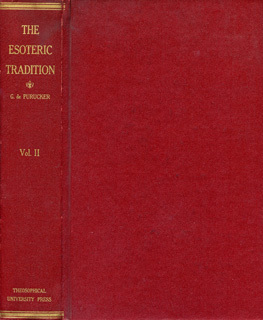 A handbook of Oriental and theosophical terms most frequently found in occult literature, including a comprehensive outline of the philosophy behind those terms. If you would like to support this online literature initiative with a donation (online by bank, credit card or PayPal) you can use the button below.